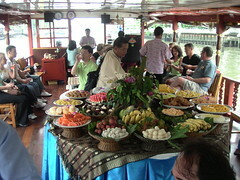 The trip included this amazing fruit tray and all the Mekong whiskey you could drink. The list of fruit was: Papaya, two types of lichee, Thai apples, pineapple, mangos, bananas, durian, watermelon, peanut brittle, and god knows what else. The Mekong whisky is a rice-based whiskey that tastes more like rum. Very nice!